Units were designed by 13 different architects. Each unit's interior and exterior layout was freely designed within a system of coordinating rules for positioning various elements. The generous floor-to-floor height allowed for the introduction of utility distribution space above ceiling and under raised floors; therefore, ducts and piping to pass over the beams without use of "sleeves" to the main horizontal utility zones under exterior corridors or "street in the air". The building frame (or "skeleton"), exterior cladding, interior finishes, and mechanical systems were designed as independent building subsystems, each with a different repair, upgrade and replacement cycle following CHS* principles. 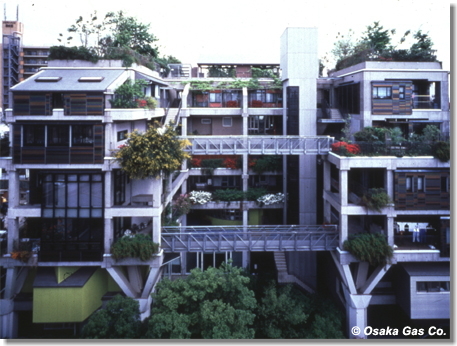 Design of the 18 units began after design of the building frame and continued during skeleton construction. Dwellings and their mechanical systems were designed prior to design of the base building's* mechanical system. Subsequently, mechanical services at all levels were installed by a single contractor. NEXT21 was constructed as a whole, but designed in such a way that its various subsystems can be adjusted with improved autonomy. To test this objective, one 5th-story unit has been substantially renovated. All work was accomplished from within the unit, without scaffolding, minimizing disruption to abutting inhabitants. 90% of the materials removed were successfully redeployed. The project continues to explore new methods for building urban housing, experimental infill systems*, to accommodate varying lifestyles with reduced energy consumption. The second phase of NEXT21 includes renovating other units, including a new group of inhabitants, and continued evaluation of the energy system. Besides creating a comfortable environment, it is also hoped that the green areas on the roof, on the terrace on each floor, and on the ground floor of NEXT21 will be useful in other ways, and will eliminate latent heat caused by evaporating moisture. A "3 dimensional street" has been designed as a natural element linked with the Ecological Garden, and as vital common space for allowing communications between dwellers in each of the houses. Each of the dwellers will be able to enjoy the atmosphere of the regular street while maintaining privacy in their different lifestyles. "Systems building" refers to a building in which methods for adjusting the individual component systems of the building -such as the main structure, external walls, and windows- are established. At NEXT21, a highly flexible architectural system is being put into practice. These component systems are divided into four groups according to the required life of each component and production path, and are then manufactured as separate systems and modules so that outer walls, baths and toilets, and gardens can be moved. The "two-step housing supply system*" is a system that divides building elements into two groups: long-life elements with high degree of communal utility such as columns, beams and floor slabs, and short-life elements in private areas such as partition walls, building facilities and equipments. After grouping building elements in this way, planning, construction, and supply proceed. The major advantage of this system is that the needs of the inhabitant can be reflected while maintaining social worth as a city space and as a building. By incorporating this two-step housing supply system at NEXT21, designers were attempting a new design system for housing that is capable of addressing individual needs.